Home Book Reviews CARBSMART TO THE RESCUE! Dr. Atkins popularized the Fat Fast, based on the Keckwick diet developed in the 1950s by Prof. Alan Keckwich and Dr. Gaston Pawen. Fat fasting forces the body to burn stored fat by depriving it of glucose (sugar). Since even protein can be partially converted to glucose via a process called gluconeogenesis, eliminating almost everything but fat guarantees that even those who are most metabolically resistant to weight loss will switch to burning fat rather than sugar. By limiting calories to 1,000 per day, stored fat will make up the difference between the dietary fat coming in and energy needs. You might think that eating a diet that is 90% fat would take a lot of discipline. You may even doubt that you can do it. This book will change your mind. While Dr. Atkins suggested five feedings a day of things like two egg yolks with a tablespoon of mayonnaise, two ounces of cream cheese, or one ounce of macadamia nuts, Dana Carpender and the CarbSmart team have cooked up some recipes that are rich, interesting, varied, and very filling. You can enjoy some really tasty treats that will keep hunger at bay while you rev up your metabolism with the magic of nutritional ketosis. Some, like Mac and Cheese, Fettuccine with Pancetta Cream, and Curried Coconut Cream of Chicken Soup, will make you feel like you’ve had a full meal. There are also plenty of treats here, Pumpkin Pie and Chocolate Cheese Mousse, for example. 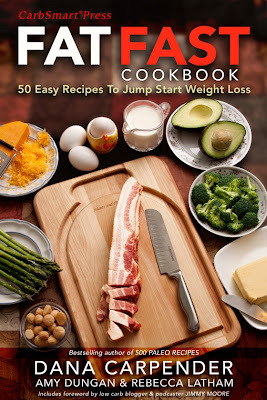 Carb Smart, Fat Fast Cookbook. Bookmark.